Summer’s officially here! And many of us are reaching for those cool treats, like popsicles and ice cream (YUM), to beat the summer heat. But, much to our dismay, some of us may find that these cool snacks cause tooth pain or sensitivity. This can be a sign of a number of oral health issues, which can be addressed by Dr. Schultz and her team. Read on to learn what can cause cold sensitivity, and what you can do about it. Enamel Erosion- Our teeth are covered with enamel, which works to protect against hot/cold temperatures and sticky/abrasive items. If the enamel thins or wears down, teeth can become sensitive because they’ve lost part of a protective layer that insulates the nerve fibers of the tooth. Enamel erosion is often caused by an acidic or sugary diet, acid reflux disease, and/or age. The best way to avoid enamel erosion is to protect your enamel early on! You only get one set of enamel—once it’s lost, you can’t regain it. So do your best to avoid acidic foods/drinks, and use a toothpaste such as Pronamel (if directed by Dr. Schultz), that protects thinning enamel and helps prevent sensitivity. Receding Gums- Under our enamel is a softer part of the tooth, called dentin. 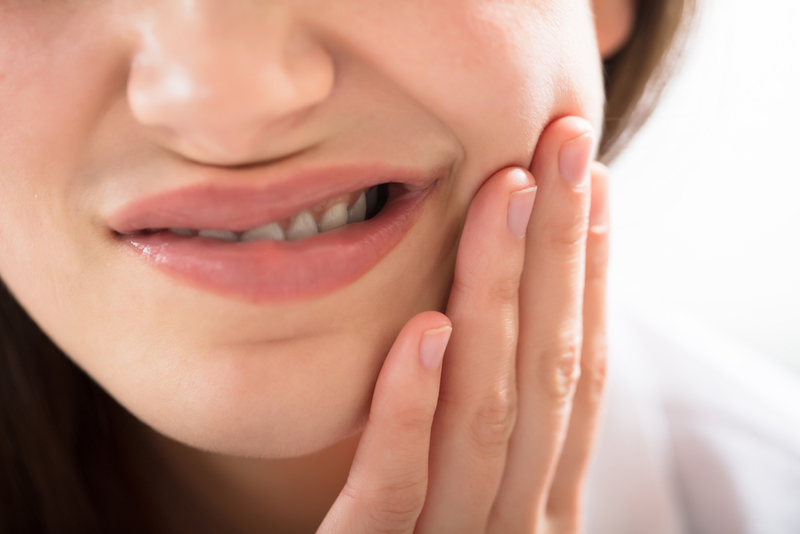 When patients experience receding gums, the dentin or root surface of the tooth is often exposed, in many cases causing sensitivity and/or pain. Receding gums most commonly occur because of genetics, an aggressive brushing habit, and/or grinding and clenching. The best way to avoid a situation of sensitivity due to recession is to use the right toothbrush with the right technique, and talk to Dr. Schultz if needed to discuss any grinding/clenching habits that you may be aware of. Cavities- Cavities can also expose sensitive nerves to the elements. If you are experiencing sensitivity to cold foods or beverages, a cavity may be forming. Also, fillings that become loose or fall out can cause sensitivity where the original cavity was located. If you think you may have a cavity, let Dr. Schultz know. That’s why routine check-ups are so important—they can help prevent the need for a filling! No matter what the cause for your tooth sensitivity is, a visit to the dentist can usually help to determine which course of treatment should be taken. If you are experiencing tooth sensitivity due to a loose filling, cavity, or receding gums, dental treatment is most likely needed to correct the issue. In some cases, an infection deep within the tooth can cause sensitivity as well. If this is the case, you may need to undergo a root canal to address the issue. You can also take steps to prevent tooth sensitivity from occurring in the first place. Be sure to follow a regular oral hygiene routine to prevent tooth decay and gum disease. Also, avoid sugary snacks and sodas, as these can cause decay and/or acid erosion of the enamel. If you are experiencing cold sensitivity, contact Schultz Family Dental to schedule an appointment! Dr. Schultz will work with you to determine the cause of your tooth sensitivity, and create a treatment plan that works to address your concerns!